I finally finished up the last couple of black bananas —yay! They were really ripe but that’s OK. The recipe calls for ripe bananas! 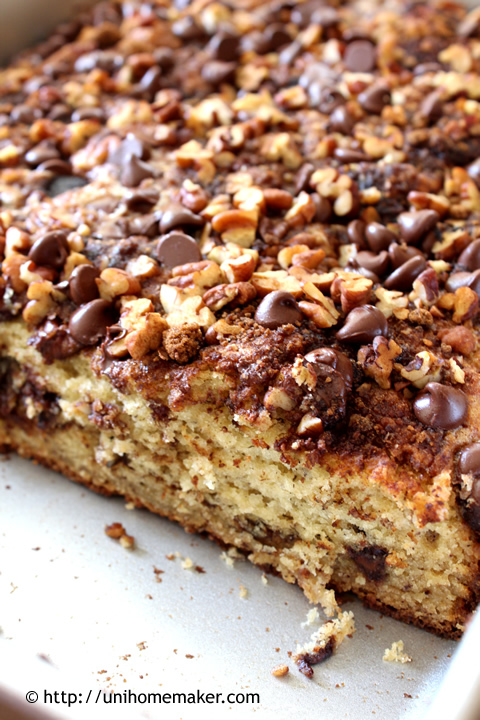 This cake has all my favorite ingredients —bananas, cinnamon, ricotta, and chocolate chips. I added the pecans in here to give it texture but you can totally leave it out if you are not a nut person. Preheat the oven to 350 degrees F. Grease a 9″ x 13″-inch baking pan. Using a stand or electric mixer (or mix by hand) cream butter and sugar until fluffy. Then add bananas, eggs, vanilla extract, ricotta cheese and milk. Beat until well combined. Add flour, baking powder, baking soda and salt. Mix until just moistened. For the filling: In a separate bowl combine muscovado sugar, ground cinnamon, chopped pecans and chocolate chips. Mix well and set aside. Pour half of the batter in the greased baking pan. Sprinkle with half of the filling. Spoon the remaining batter over the top, using a spatula to spread evenly. Sprinkle the remaining filling evenly. Essentially, you are layering the batter and filling twice. Bake for 45-50 minutes or until toothpick/tester inserted into the center comes out clean. Allow the cake to cool completely before cutting into the pan. Aren’t they delicious? I love the texture of the filling. Vietnamese cinnamon is stronger and bolder. I personally prefer this cinnamon because flavors can get lost with regular cinnamon, I find. Oh wow this looks amazing!! I haven’t baked with ricotta before but definitely want to try this. Unfortunately all my bananas are green so it will have to wait. Or maybe I’ll make a pumpkin version… Thank you! 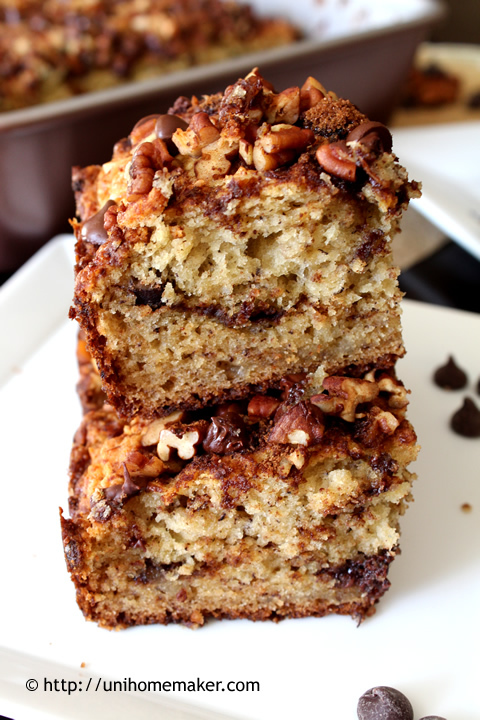 Wow, this banana cake looks very moist and delicious! Thank you for sharing the recipe. OMG – this looks soooo delicious!! It turns out that I have a hiatal hernia – and my stomach is hurting…. but I can’t wait to make this once my “tummy” feels better. Looks Y.U.M.M.Y. !!!!!!!!!!!! That will be perfect for the frozen banana I have at the bottom of the freezer. Thank you! I Choose to eat in the morning, Anne …..at what time i can be there??? :)thanks for sharing!!! Looks incredible. *sighs* Still haven’t made mine. Hello my new breakfast cake! I am going to try this. That looks amazingly delicious. All of my favourite ingredients in here as well! i love pecans so I would definitely have to have them. Gorgeous combo! Great photos Ann. Makes me want to rush to the kitchen to make it …and use up my black bananas that are a bit of an eye sore. 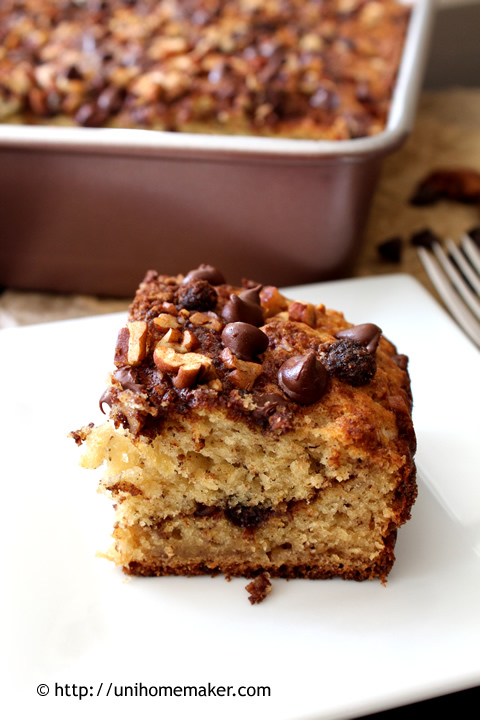 Such a decadent banana cake! I’m making banana cake too tonight but a much lighter version with cinnamon and raisins. Sounds delish! Will have to check back your blog when you post it. Yum!!!! I too am intrigued by this Vietnamese cinnamon. How does it differ from the usual? Thanks Claire! Vietnamese cinnamon is stronger, bolder, and stands up in flavor than your average cinnamon that you get at the store. For me, regular cinnamon can get lost in flavors sometimes so I used Vietnamese. By all means, you can definitely use regular cinnamon for this recipe. You certainly didn’t skimp with the goodies in this recipe. And just to be sure, you added banana and ricotta, making this cake so good that its evil. I’m pinning this one, Anne. It must be made! Life’s short eat dessert first! You even added ricotta cheese and chocolate bits, this one has to be a winner of a recipe. My bananas always ripen so quickly sometimes even within a matter of a couple of hours. How lovely! I happen to have extremely ripe bananas, cinnamon, chocolate, and lots of ricotta. I guess I’ll be baking today! You wouldn’t be able to keep me away from that cake! It looks sooo Good! I wish I had a piece of this cake with my coffee right now. It looks wonderful. I too think this is definitely for breakfast. Has all the breakfast ingredients, well may be missing bacon, wonder how it would taste with crisp bacon incorporated into the filling? That looks like a wonderful cake! I bet it’s really nice and moist with the banana and ricotta in it! Thank you so much! Hope you’ll enjoy it as much as I have. Have you ever made this in a Bundt pan? Just wondering. I am standing at my mixer about to begin! If I put the topping in the pan first, so it will end up on top, I’m thinking the chocolate chips might burn. That would not be good. Maybe I’ll just play it safe and stick with the 9×13. I have not made this in a bundt pan but yes, I have a feeling the chocolate chips may burn if you put it on the bottom. How did I miss this! I love ricotta and banana so I can only imagine how glorious they are combined! This looks wonderful! Can’t wait for the bananas to get overripe!